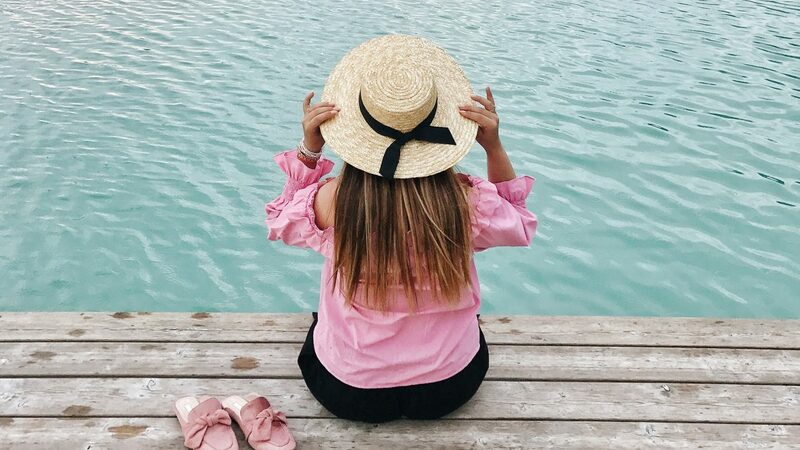 Barbara is a 26 year old girl from south Italy but living Milano, where she is studying Marketing and created her Instagram page @lovefashionstyle, a diary of her everyday life, passions and travels, always with a touch of pink! If someone has told Barbara the word “Salzburg” some weeks ago, Mozart and the Unesco would have been the very first thoughts that would have gone through her head. She never expected that behind that cultural surface there is an amazing city truly full of surprises but… Let’s start from the beginning! 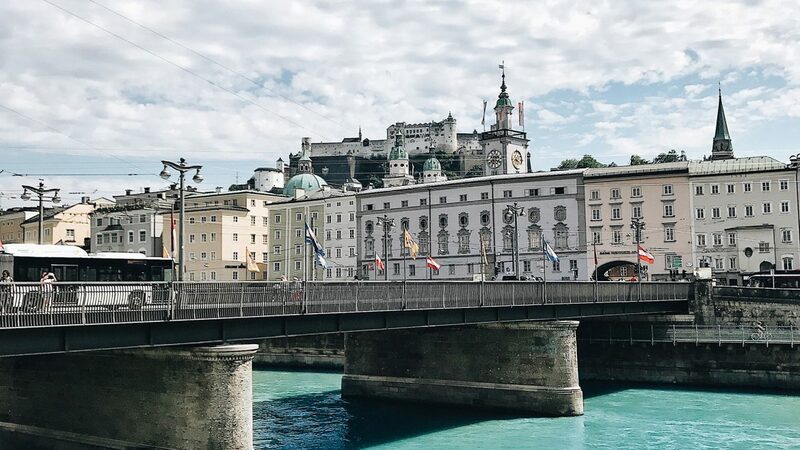 At the end of spring she was invited to spend three days in Salzburg to visit the city with “a local friend”, an influencer from Salzburg, to get the best of the city and act like a local for the whole trip. She was impressed by the proposal and super excited about starting this new adventure with @VisitSalzburg and @Salzburgerland! Shortly after she was at the Milano Central Station ready to travel to Salzburg with her boyfriend Federico. Catching the overnight train was also new to Barbara. She prefers travelling by plane, but didn’t expect how comfortable the NightJet of the austrian train company ÖBB would be. The ten hours journey was perfect: the train had a well-planned departure time, the “Gran Classe Cuccetta” for Barbara and her boyfriend was really clean with a soft bed to lie in to have rest during the night. The train assistants were helpul and eager for any request. The taxi was waiting right in front of the Hauptbahnhof and in 15 minutes Barbara and Federico were already at the wonderful Hotel & Villa Auersperg. The location was stunning and they immediately loved having a delicious Austrian breakfast in the garden. They also got the Salzburg Card to freely stroll around the city. For lunch they had a sky terrace reservation at the Imlauer Skybar! As soon as Barbara and Federico got there, they were astonished by the Salzburgskyline and the cool restaurant. During lunch Barbara met Stefanie, her local friend. Barbara was a little bit nervous, but the two girls matched as soon as the main dishes came: they asked everyone to not eat their plates so they can take an on-the-table-picture first. After lunch, they had a first walk around downtown Salzburg under Stephanie’s guidance. 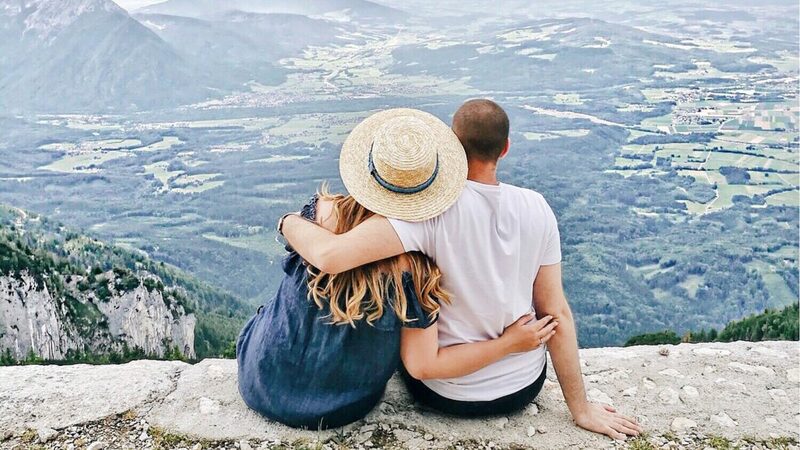 They passed through the Mirabell Garden and fell in love again: Barbara has already seen the garden on the internet and it was a dream coming true to take a picture of that magical view. Barbara wanted to come at sunrise to take some pictures without people walking around. Later that night, dinner was planned at the Red Bull Hangar 7, a wonderful place full of innovation right next the airport. They had the chance to attend an exhibition and enjoyed a cocktail inside the Hangar. Barbara’s boyfriend was super excited and took plenty of pictures of all the cars and planes inside. On Saturday, the second day, they went to the city market for shopping for a picnic. 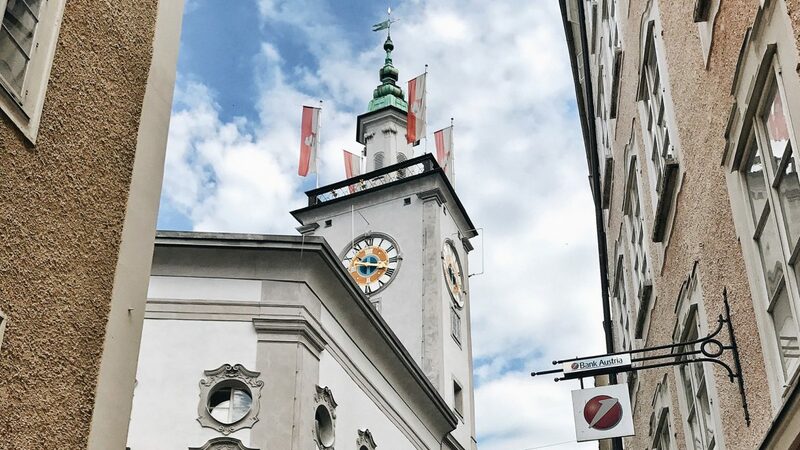 Stefanie told them that on Saturday the Grünmarkt is bigger and they could shop some Austrian treats and delicacies: fresh vegetables, rasperries, Bretzels and some good cheese are to mention! When the picninc basket was full enough they headed to the Mönchsberg. The mountain is located in the city center and they were surprised that they only had to take the elevator to go up. The landscape was typically Austrian and once they found a green land with a caste they put down the blanket and start taking a huge amout of pictures again. Barbara and Federico loved the Bretzels! Finally it was time for “pink things” for Barbara. 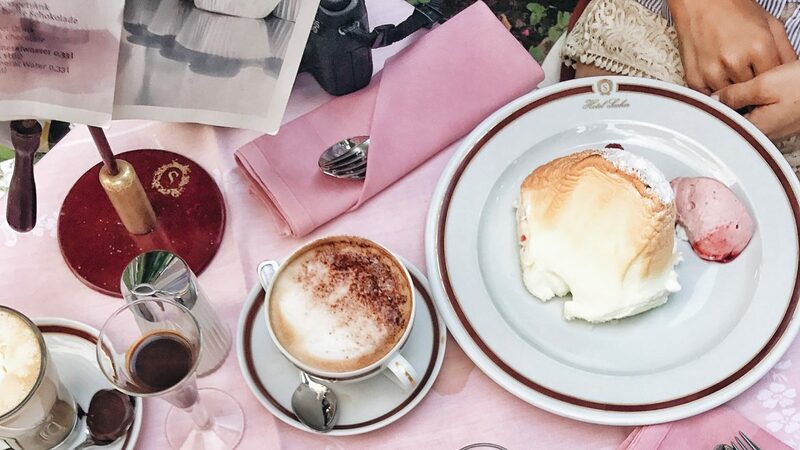 She truly wanted stop by the Cafè Schatzi and the Konditorei Fürst where she finally could taste the famous MozartKugeln and buy plenty of things for family and friends. She said that in Italy they don’t have anything similar. Barbara was also in love with the next location: the Hotel Sacher. That pink luxurious spot next to the river was the best place for her. She could also taste the Salzburger Nockerl and guessed the recipe! Afterwards they visited the Fuschlsee. For the first time Barbara saw a lake with that crystal water. During the dinner they had the chance to try the famous Reisfleisch, and Barbara said that she loved the meal and wanted to eat it again at restaurant Fuxn. On the third day they woke up at 5 a.m. to shoot the Mirabell Garden at sunrise, to have a quick breakfast at Tomaselli and then they met Stefanie to go together to Gossl Gwandhaus, a huge villa on the outskirts of Salzburg. Once a year the villa is the location hosting the Dirndlflugtag, where girls and ladies get dressed with the typical Dirndl dress and jump in the water from a high dive. They even have a jury evaluating the jump! 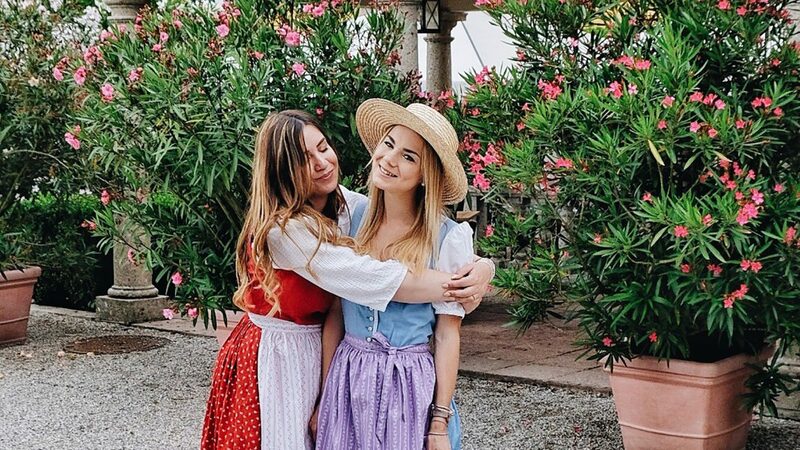 Barbara tried a Dirndl with Stefanie but the two girls were too scared to jump. The journey continued with a stop by the HellBrunn Castle, famous for its water fountains and its magic garden. Barbara was also able to spot a squirrel! 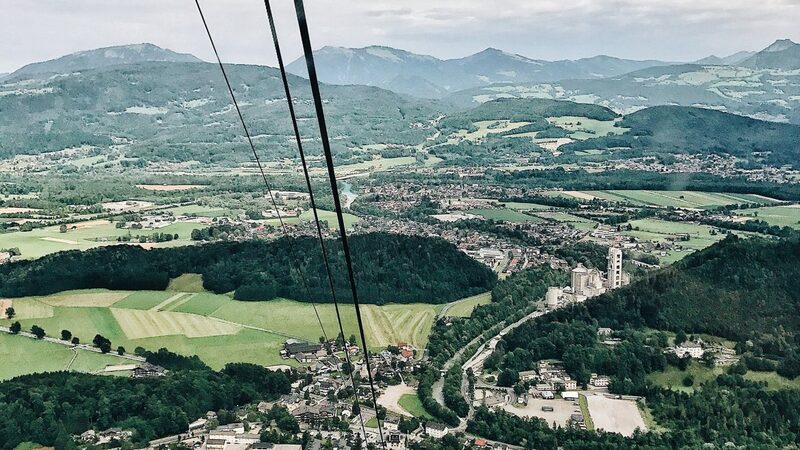 The last stop was the Untersberg, one of the highest mountains of the region, and this time they went up 1,800 meters by cable car. Barbara was super scared but the unbelievable landscapeon the top was worth that fear. They planned to stay half an hour but at the end they stayed longer. 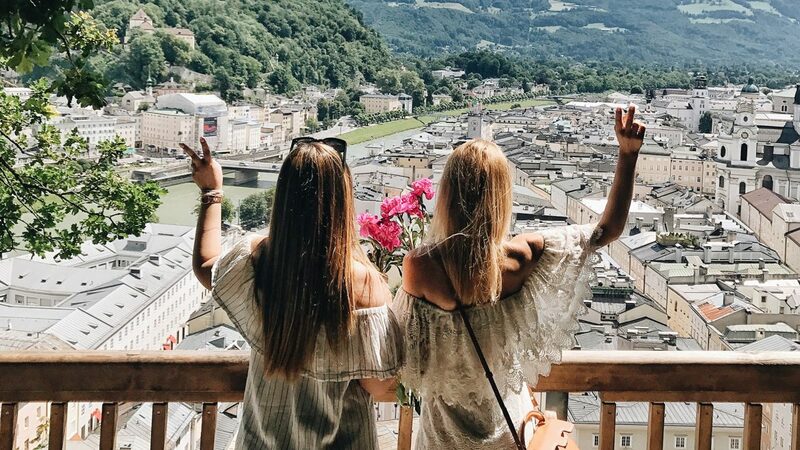 Barbara and Stefanie were all about taking pictures for Instagram and could not miss the chance to take one of the best pictures ever together! Suddenly it was almost time to go back to Italy. But a delicious Austrian ending was around the corner: a dinner at the StieglKeller, another famous typical Austrian restaurant with a stunning view on the Salzburg fortress. Barbara wanted the Reisfleisch again but she tried dumplings instead, she was really in love of how meat is cooked in Austria. The three days in Salzburg were gone quite fast. Barbara and Federico were so so sad to go back to Milano. Barbara found a friend in Stefanie and the girls were already planning to see each other again in Milano or Salzburg, on the occasion of the Christmas market perhaps! Having the chance of spending three days together with the local friend Stefanie was an experience they will never forget. It was a chance not only to vist and see the city of Salzburg but also to live in it like a local, get the best advice on public transports, restaurants, clubs and shopping, that cannot be found on the internet – doing that kind of things only one person who lives (and loves) the city would do!